It's time for a Southwood Tallahassee real estate report, and I have pulled 1720 closed home sales from the Tallahassee MLS. Currently, there are 59 homes for sale in the Southwood Tallahassee MLS, and sales this year have been a fair mix between new construction and existing home sales, distressed and arms length home sales. Southwood home values are on the rise, but distressed property values have fallen and threaten to bring arms length home sales with them. A search of Southwood Tallahassee home listings shows a divided market. In the real estate graph above, arms length home sales are shown in green while distressed home sales are shown in red. The past 12 months has seen a gentle rise in arms length values but a dramatic decline in distressed home values. 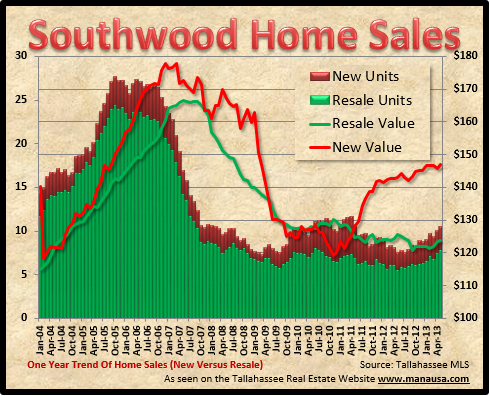 The graph below records the differences between new home sales and existing home sales in Southwood Tallahassee. New sales are shown in red while existing home sales are shown in green. Currently, new values have trended up to about $147 per square foot, while existing homes in Southwood Tallahassee are selling closer to a $124 per square foot. As new construction is finally starting to slow down in Southwood, distressed properties are on the rise. 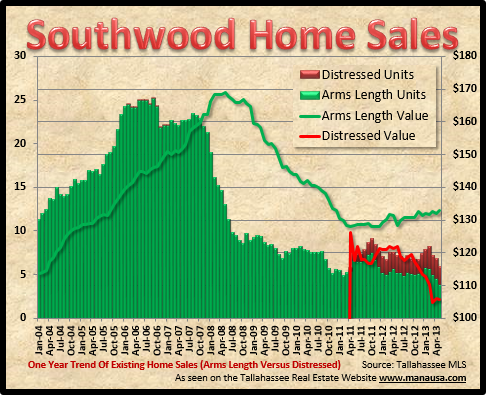 Current Southwood Tallahassee homeowners should keep a close eye on the graph above. Distressed home sales are rising even as they fall almost everywhere else in the Tallahassee real estate market. New construction continues to sustain a rate of 25% of the overall market, with low-interest-rate buyers opting for the new homes right now. Hopefully Southwood will get its fair share (and more) of the rising demand for homes in Tallahassee. 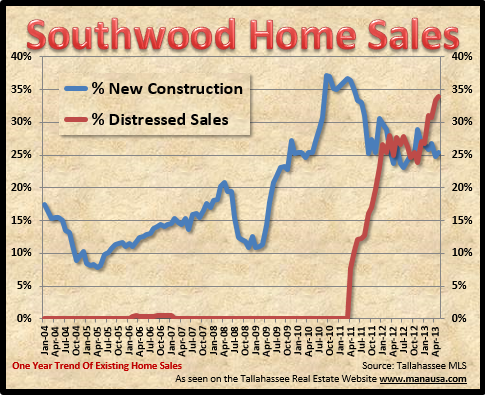 There is a large backlog of Southwood Tallahassee homes in the shadow inventory, and there likely will become a time when new construction slows to allow this growing pent-up supply to move through the market. If you have a home to sell in Southwood, drop me a note and we can show you the best way to sell your home for top dollar. I hope you gained some important insight from this Southwood Tallahassee home sales report.